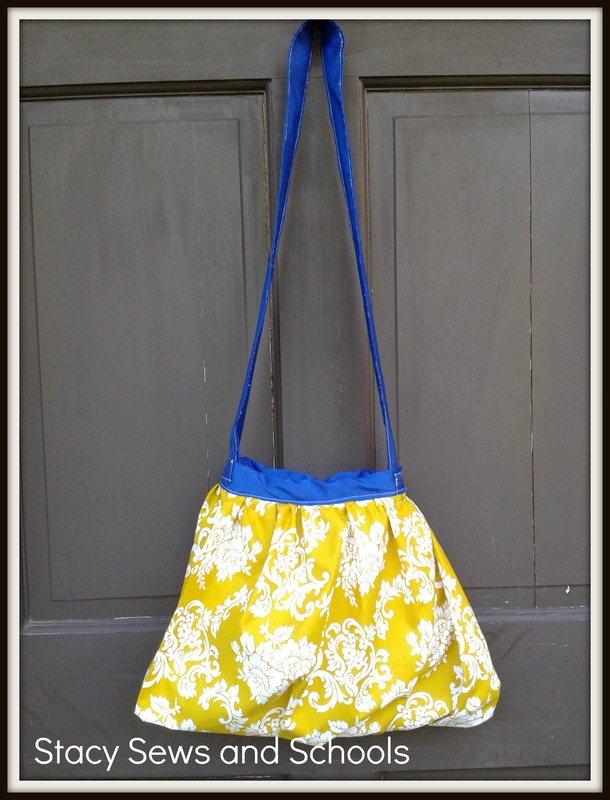 I’ve decided to call this purse the Mountaineer Girl Purse because of the colors! They are the colors of the WVU Mountaineers! 🙂 My favorite college football team! I can’t wait for the season to start! Thinking about painting that door navy blue….. I hate the blah brown. 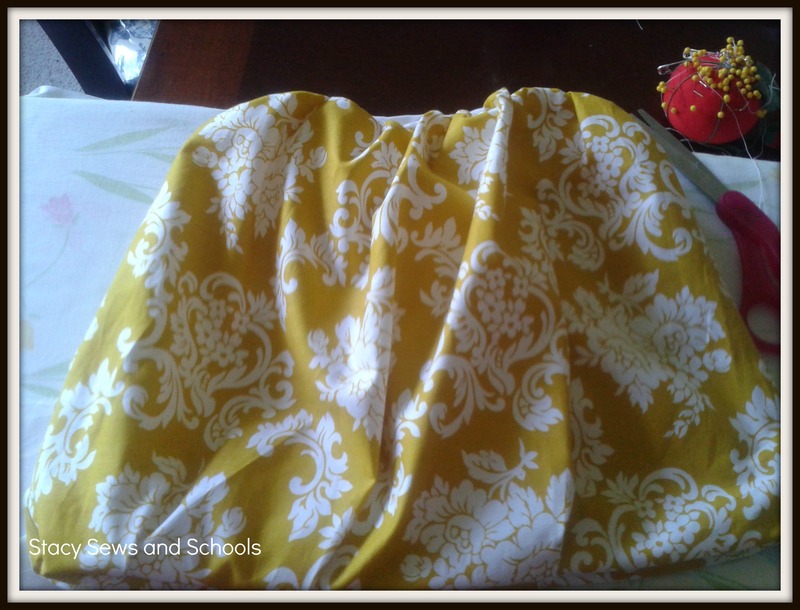 The main fabric is what I won from Handmade by Hilani. 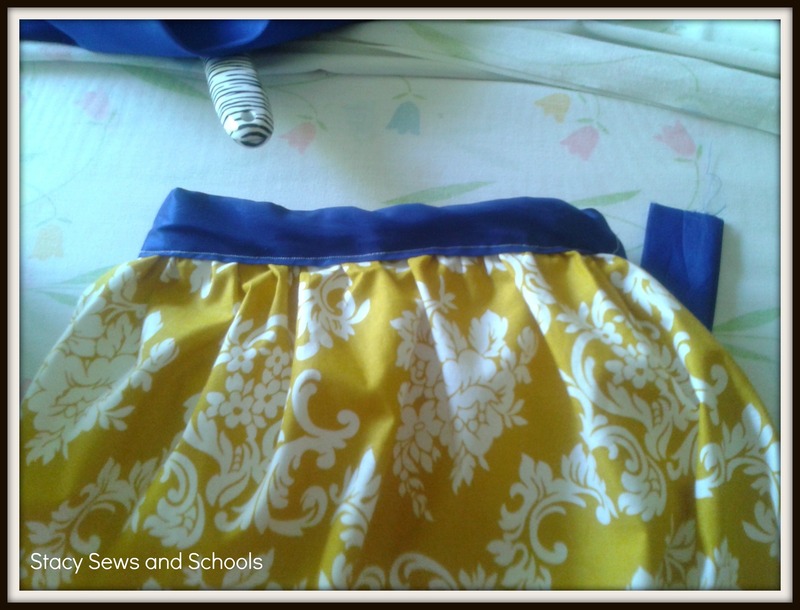 The scraps for the handle were left over from the What a Hoot skirt . 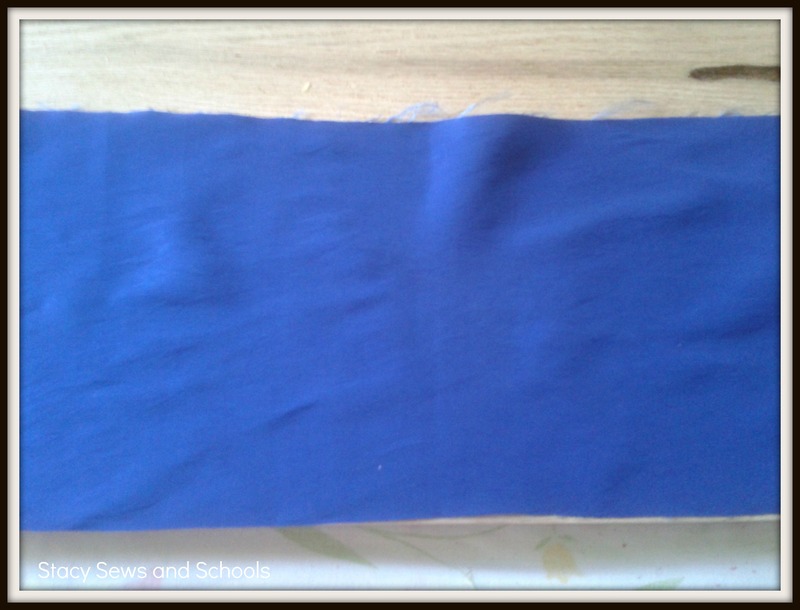 Step 1 – I finished one edge of the main fabric. 2 of the edges were selvage and the other was pinked. The one unfinished edge was already starting to fray. 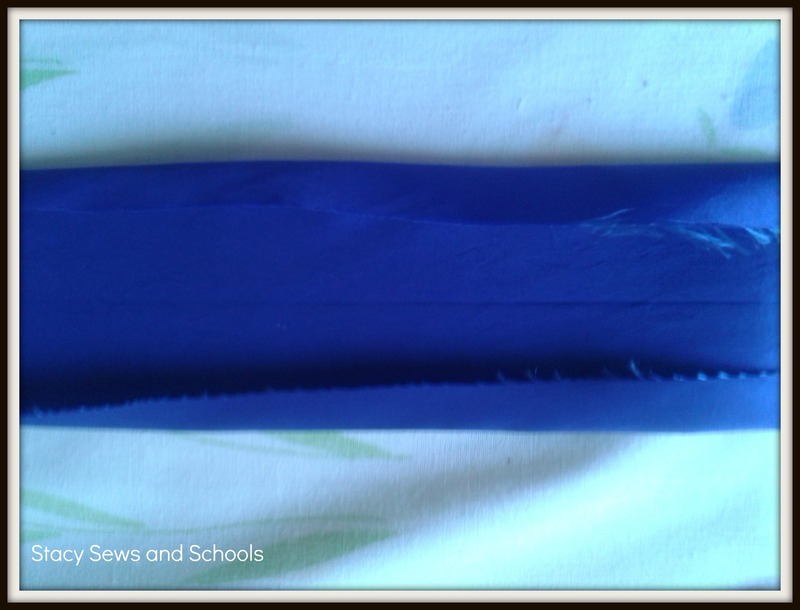 Step 2 – Turn in the edges of scraps (on 3 sides) for the pocket and press. 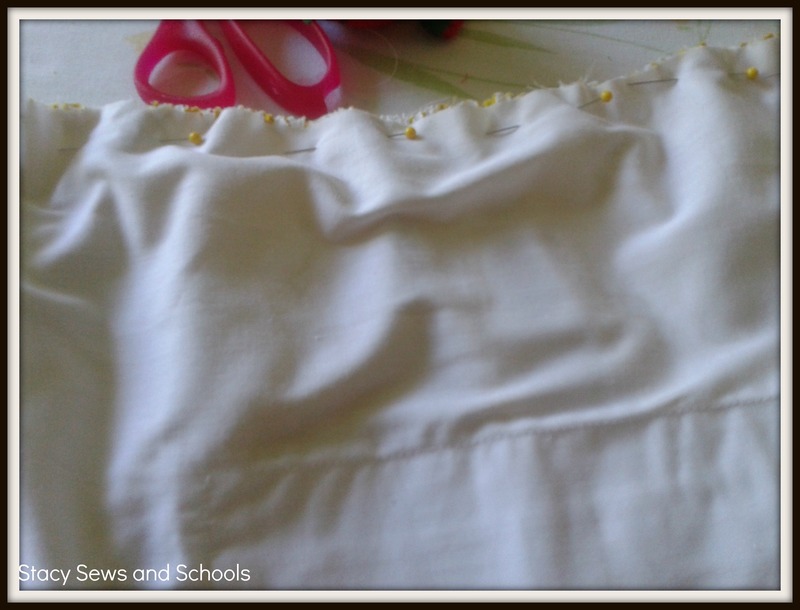 Step 3 – Turn up bottom and turn down top to create a pocket with a top. Press. 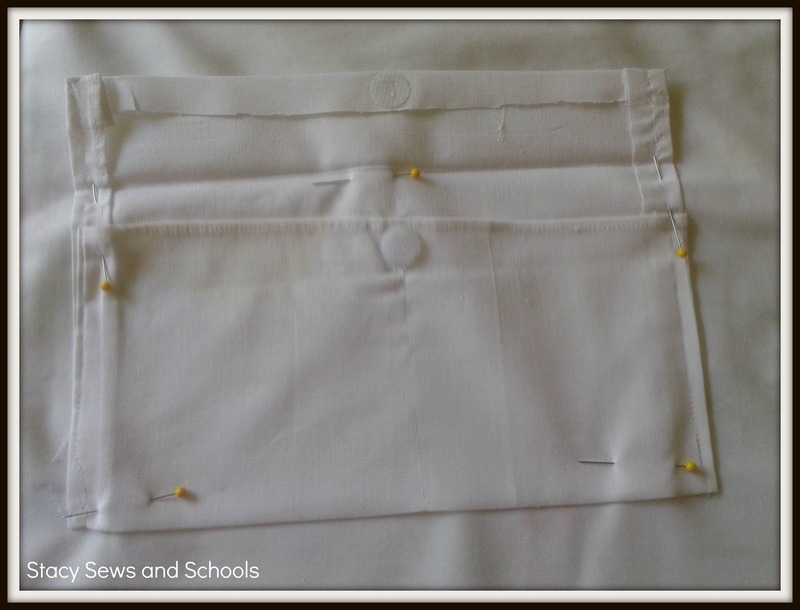 Step 4 – Sew up the edges and down the middle creating 2 pockets in 1. I also added some Velcro here for the closure. 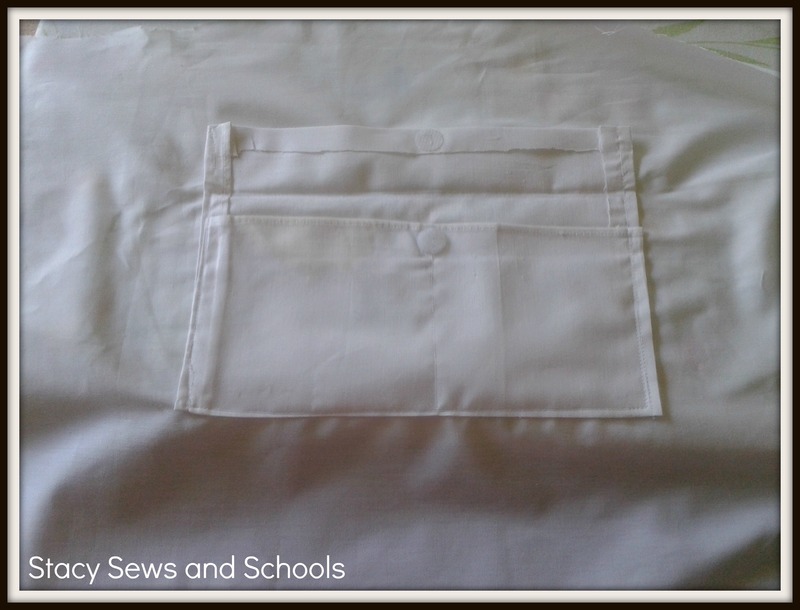 Step 6 – Sew pocket to lining. 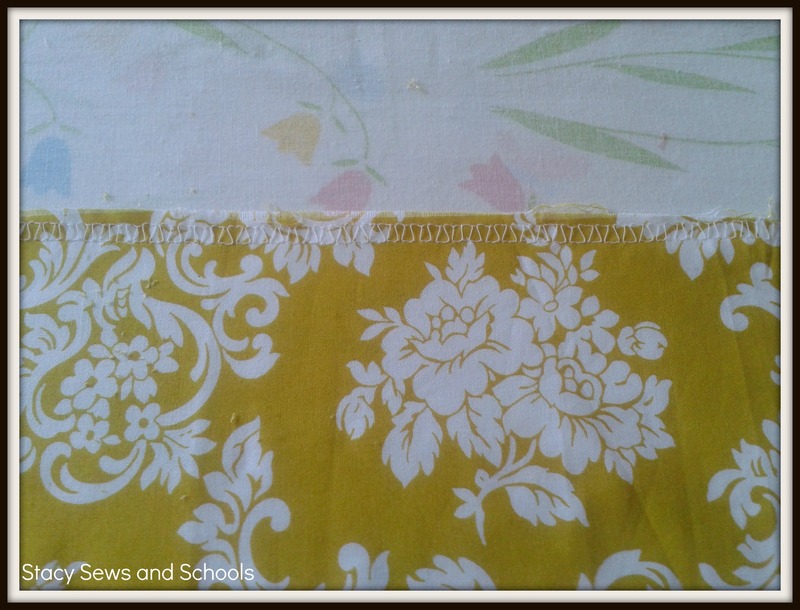 Step 7 – Run a gathering stitch across the top of your main fabric. To run a gathering stitch on my machine I set the stitch length and the space between stitches to the highest settings. The I just pull slightly as the machine runs the stitch. 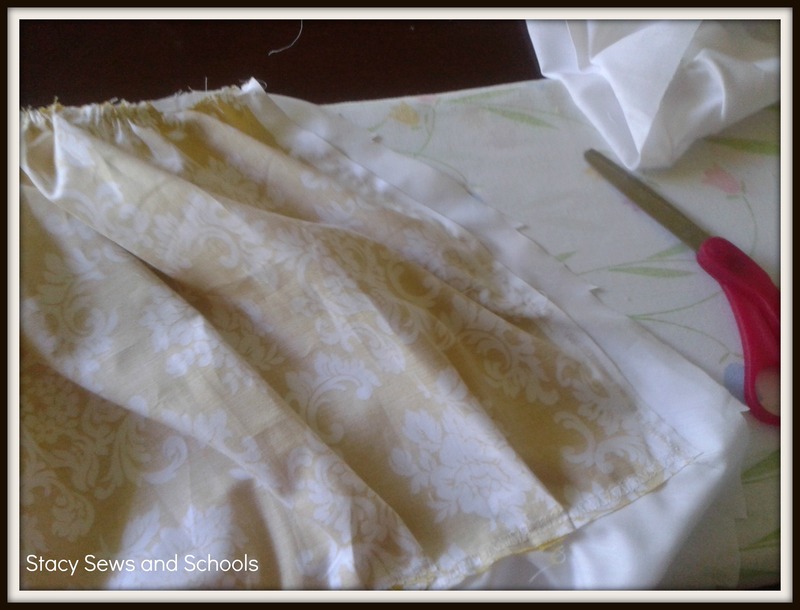 Step 8 – Pin the main fabric to the lining, right sides together. I pinned the bottom into pleats. 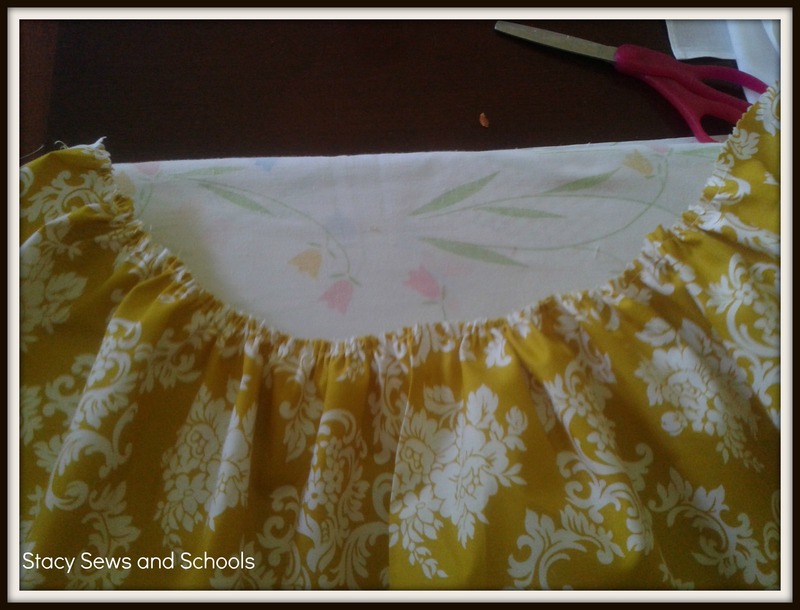 Step 9 – Sew the top, 1 side and bottom together and cut off the extra from the side seam. 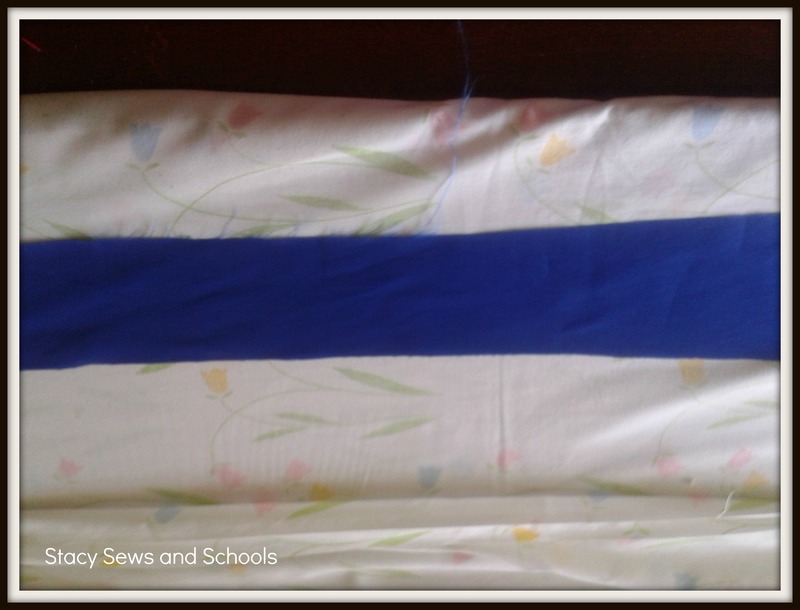 Step 10 – Turn right side out and with right sides together, pin bottom and side together. 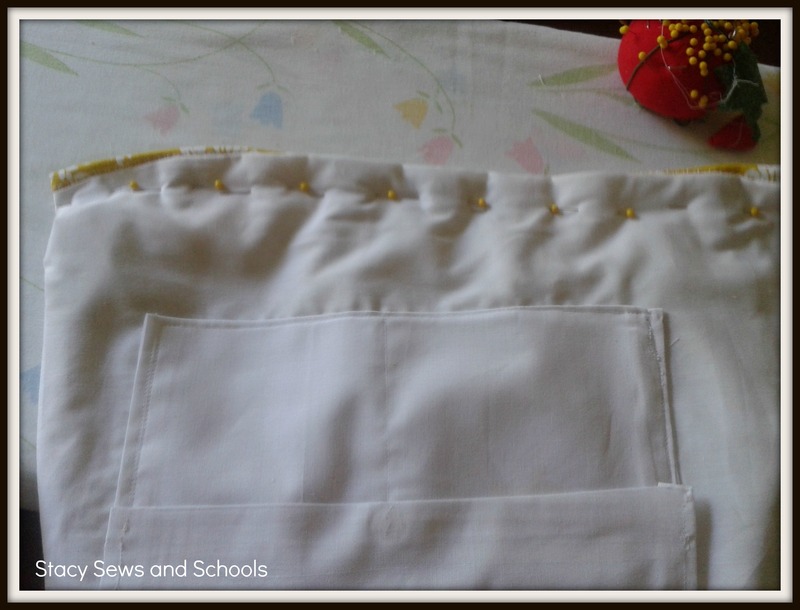 Sew bottom and open side. 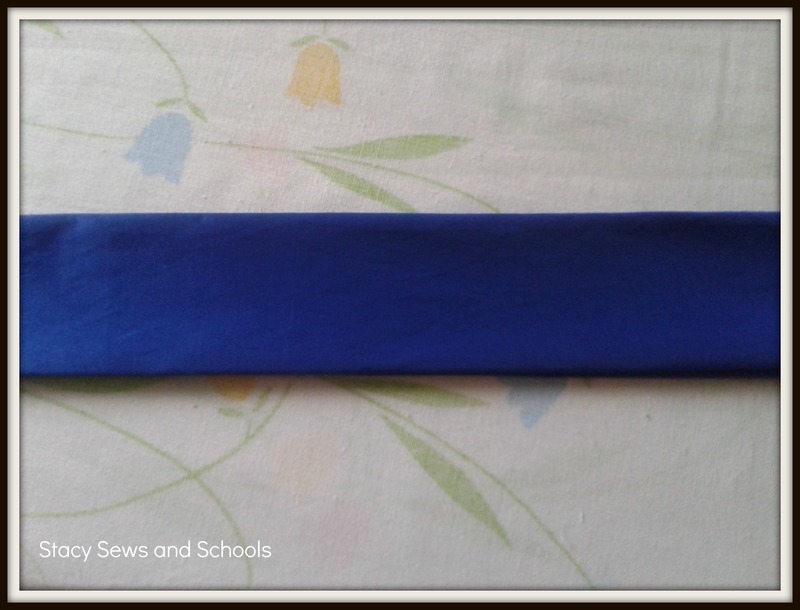 Step 11 – Cut a strip as long as the opening of your purse by 4″ wide. 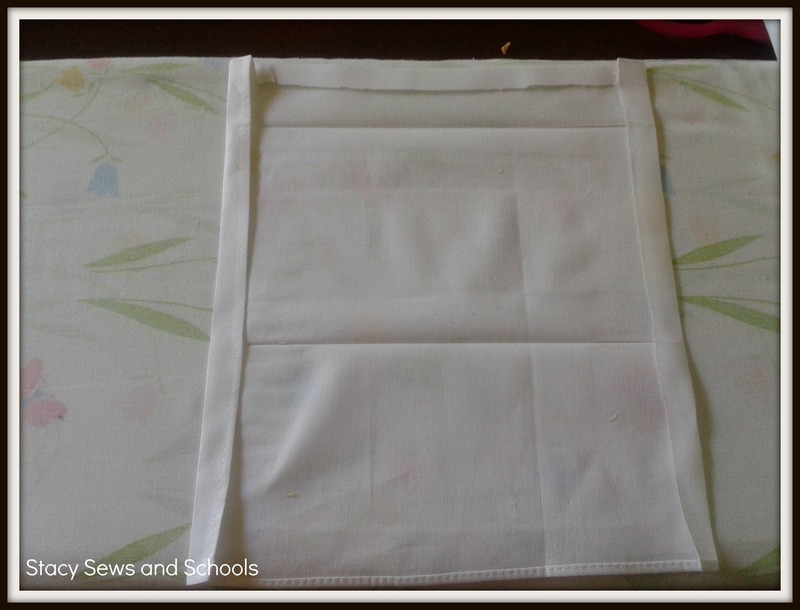 Step 12 – Fold up a 1/4″ on the top and the bottom. Press. 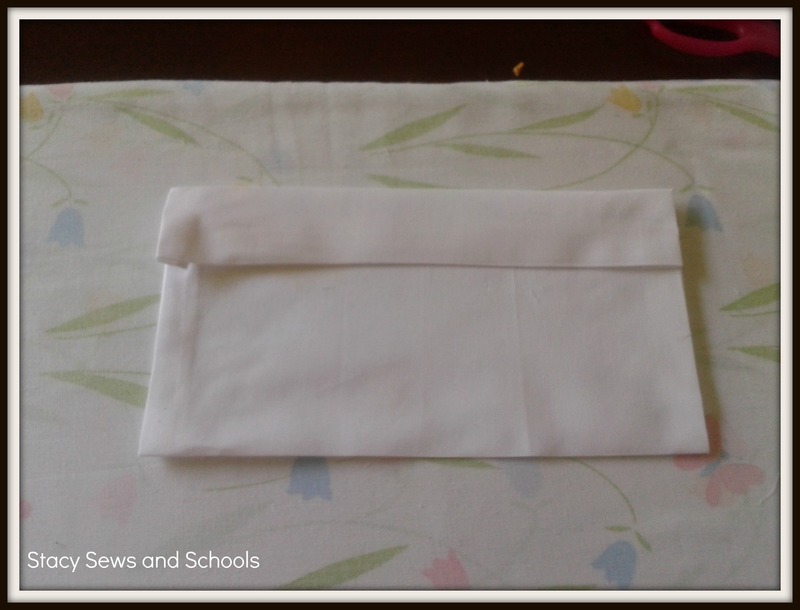 Step 13 – Fold down the middle (long ways) and press. 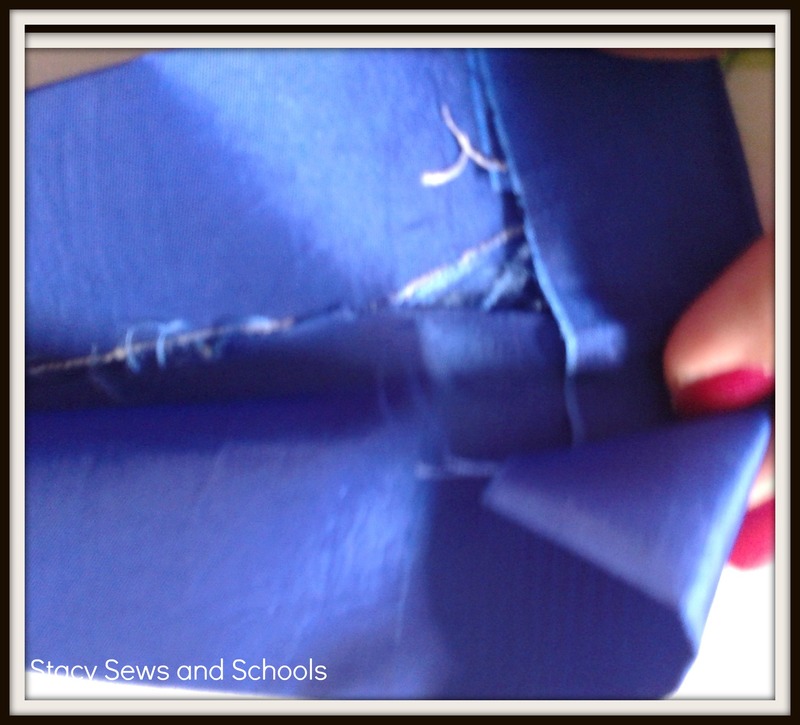 Step 14 – Open up and pin to the top edges of the purse. Sew in place. Tuck one end under the other. The fold the remaining end under and tuck inside. Step 15 – Cut a piece of scraps for your handle as long as you like by 8″ wide. 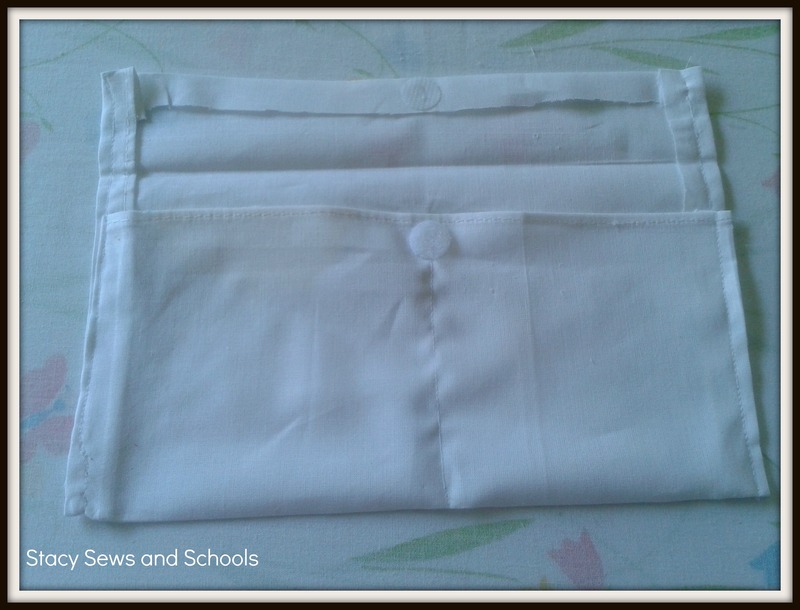 Step 16 – Fold in half (right sides together), press, pin and sew. 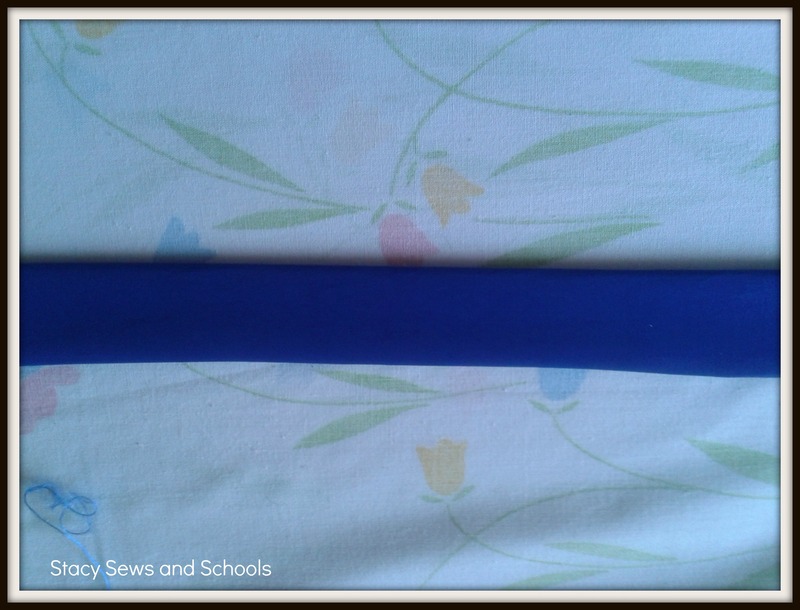 Step 17 – Turn the fabric tube right side out. Flatten out with seam down the middle and press. 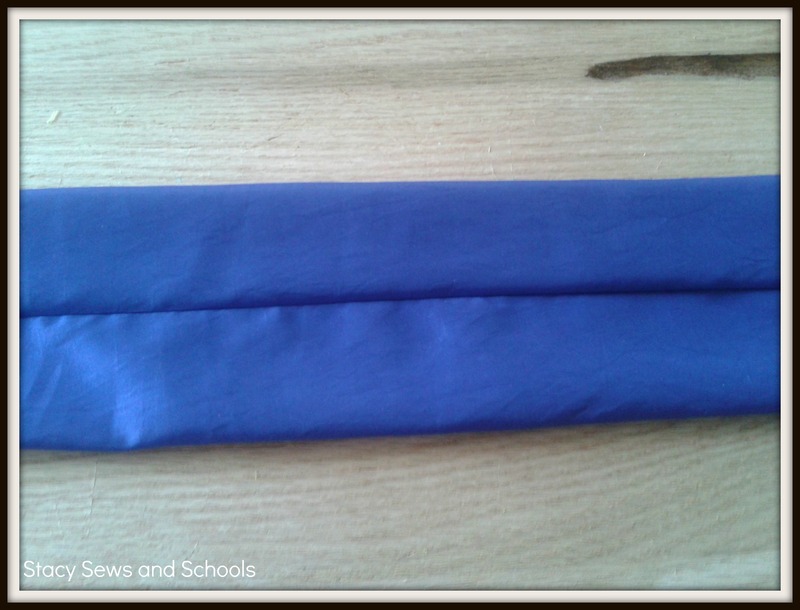 Step 18 – Fold in half (length wise) and press. 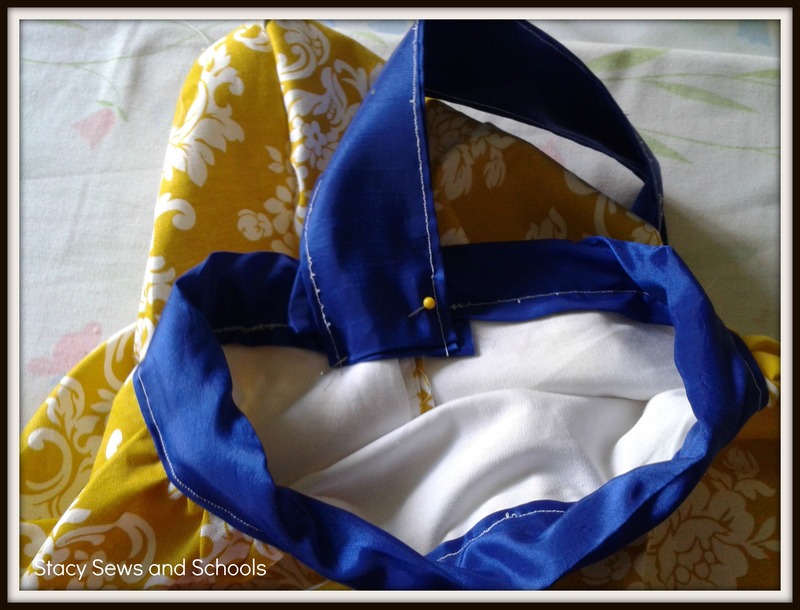 Step 19 – Open up and fold ends in. Press. 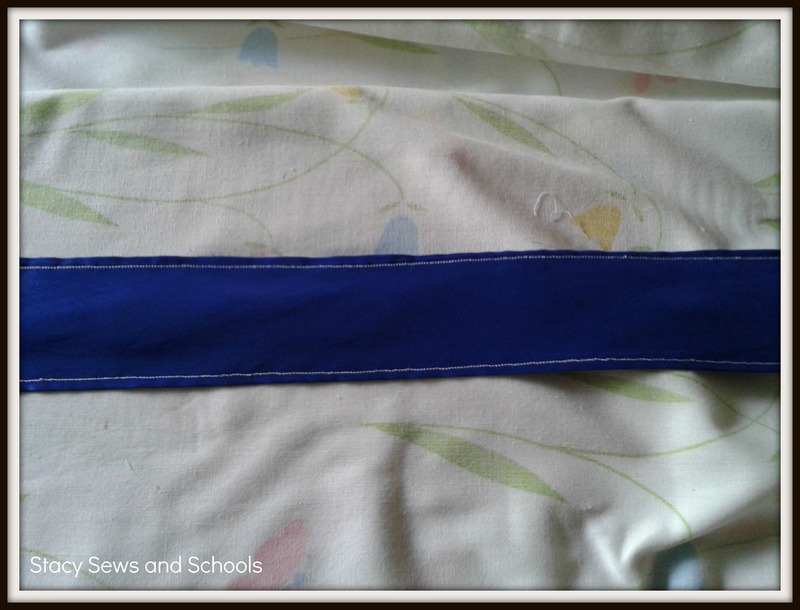 Step 20 – Sew a straight line down both sides of strap. 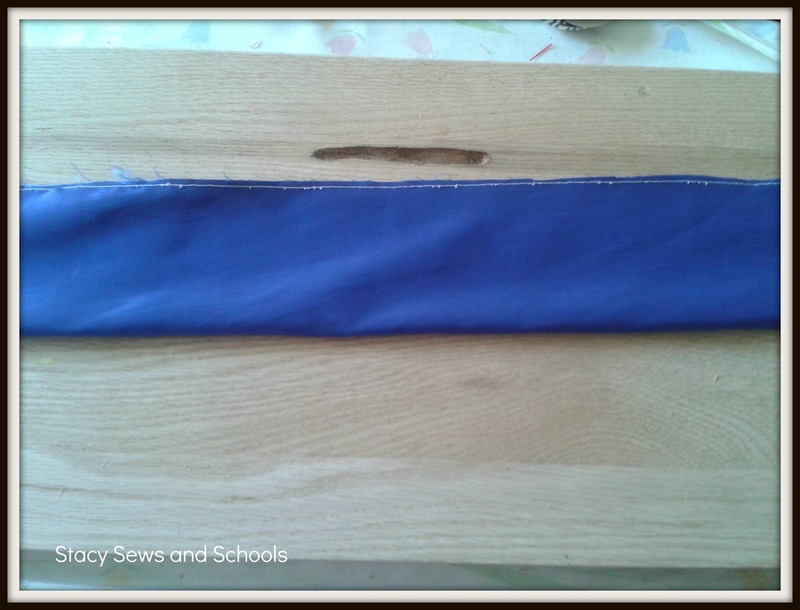 Step 21 – Pin straps to purse and sew them on! If you try this, let me know!! I would love to see it!! And, as always, let me know if you found this easy to follow!! Ya, so you received the fabric (and I’m glad to see you already put it to use)! Nice tutorial and like the blue with it, fun combination! Love it! And the step by step tutorial is very handy. I just might have to try one. Thank you for linking in to my link party. Have a wonderful and cool day. 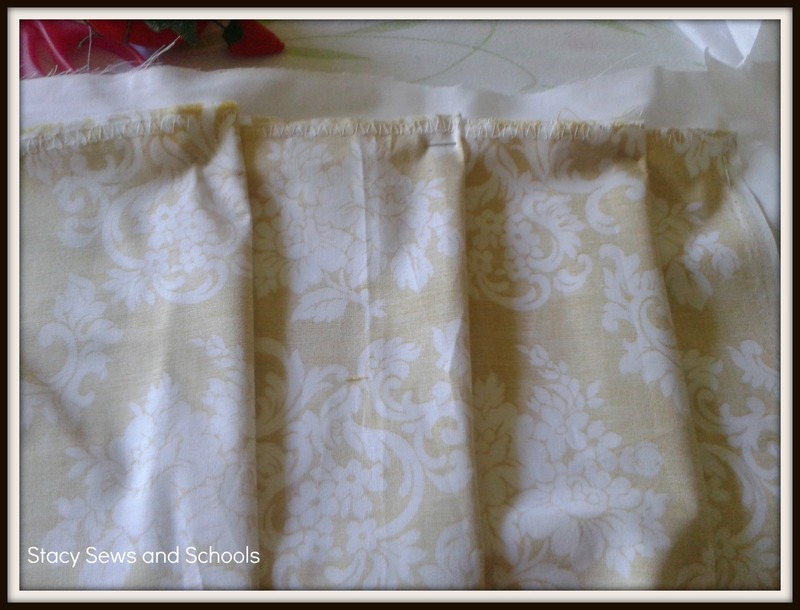 Great fabric and a wonderful tutorial. Thanks for sharing at the All Star Block Party. 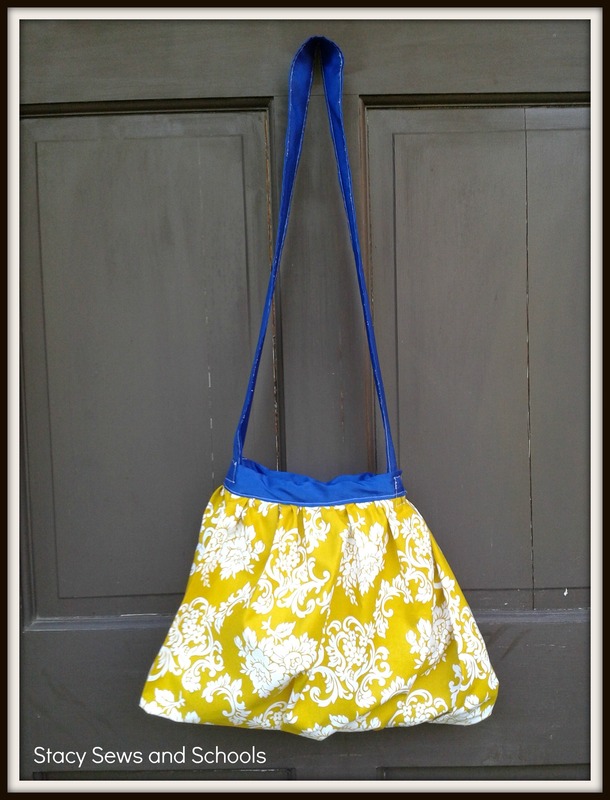 Thank you so much for linking with Wednesdays Adorned From Above’s blog Hop. I love this purse. Amazing tutorial. Thank you SO much, Debi!!! 🙂 So glad that you like it!! Super cute! It almost looks like TU colors too (gold and blue, that’s where I went to college) Thanks so much for sharing at The Fun In Functional! REally pretty and the fabric is gorgeous! Very cute! Thanks for linkin up! Can’t wait to see what you’ve made this week! I LOVE THIS!!!! Now I really wanna get the sewing machine out and try this one. :)) Awesome job! Smart gal. Loving the Mountaneers! Went to school in Fairmont @ Fairmont State about 15 minutes south of there. Wouldn’t mind being back there. Nice handy bag. Thanks for sharing. THANKS!! There is no pattern, just the step by step instructions. I hope they are easy to follow. I love it! I want to make one that is red and yellow for my 16 year old’s high school’s colors which are crimson and gold. The only thing I would do different is use a thread that is the same color as the handle. YAY!! I hope you love yours as much I as do mine!